Gayathri Pai's Food Bytes: Nendrabale kele Podi / Ripe Banana Fries. ** Nendrabale Kele is a foot long sized thick banana that is by and large grown in southern parts of India. The same is used both in raw and ripe form in various dishes. We Amchies / Konkani Saraswats are a huge fans of this one and use it extensively in our cuisine. Both curries, upkari, fries and sweets etc. prepared using the same. Over ripe bananas are used in preparing a Halwa that is thick and cut into squares and is world wide famous for its unique taste and texture. Again chips / wafers are prepared using raw bananas of the same variety and are again famous throughout the world for the same. I can keep writing about the same and it will be a never ending saga. Ahha before I forget, this is one bananas that is cut into 2 inch pieces when just ripe and steam cooked and relished. Even young children are given the same as it is considered good for constipation. ** I have already added all these before in this blog. I have also included Nendrabale kele Podi / Ripe Banana Fries before in this blog, but that was slightly different for the fact that I had made some changes from traditional method and tava fried the same while this one is the traditional deep fried method. My cousins daughter who is newly married and just settled abroad sent me a request for the same as these were available to her there and she missed them. She found my recipe slightly different and rang me querying the same. I realized I must add in the traditional method too, so that our coming generations can know them and do adaptions of their own like I do. So, you can try out both methods as I have added on its link at the bottom of this recipe. But enjoy them hot from tava as they turn up slightly limp on cooling or storing. 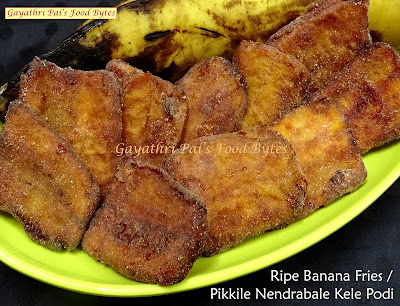 ** Here is the simple recipe for Ripe Nendrabale Bananas … These podi’s are usually served during lunch or dinner as an accompaniment with other dishes during festive season or on holy days while bajos / bajias prepared out of the same are served as snack. ** Cut the Ripe Nendrabale Bananas into three pieces horizontally and then into three pieces vertically. In all you will get around 9 rectangular sized pieces of one banana. This is usually the way it is cut, but you can cut them anyway you wish, like circular rings also. I have used only one banana here. ** Note : These bananas are large in size almost a foot long and 2 inch thick in diameter. But sometimes the sizes vary. The thickness may be lesser in which case cut them only into two vertically, lest it become thinner slices. Please use your judgement for cutting of the pieces. ** Make a mixture of 1 tblsp of less spicy red chilly powder, ¼ tsp of hing powder, salt to taste and mix well. Remove the skin of the cut banana pieces and put them in a bowl. Add in the mixture and apply this to the banana pieces and mix well. Keep this covered aside for an hour or so. If you need to prepare this later on than the stipulated time, put it in the fridge and then prepare the same. ** Keep a thick bottomed kadai with plenty of oil to heat for frying of the bananas. Now Add 1-2 tblsp of rice flour in a flat plate and spread it out. Roll the banana piece on the flour to dust it evenly on all sides and keep them ready for deep frying. When oil has reached smoking point, lower the heat and wait for a few minutes and then add in a few dusted banana piece into it. Be careful with the hot oil. Do not add too many pieces at a time. ** With a slotted spatula, slowly turn and mix out the cooking bananas in the hot oil. Once it is evenly browned, remove with the help of a ringed spatula and place it on a absorbent paper for excess oil to get dripped off. Continue with the remaining banana pieces by dusting and then deep frying them in similar manner. Remember to not over crowd the kadai as there should be enough space for the bananas to get cooked in properly. ** “Nendrabale kele Podi / Ripe Banana Fries” are done and ready to be served. These podi’s are usually served during lunch or dinner as an accompaniment with other dishes during festive season or on holy days while bajos / bajias prepared out of the same are served as snack. But nowadays these are prepared often as children are very fond of them and love the sweet bananas fried very much. Do try them out on holidays and enjoy them with your lunch or dinner. ** You can use the search option for "Nendrabale Kele" where you will get many more dishes prepared using it. Do try out various types of dishes to relish with dosa / Idly / roti etc. or with dal-chawal too. Enjoy the dishes with your family and friends and do give me a feedback if possible. You can also click on the link below for checking the same.